Part of the fallout of the Trayvon Martin shooting was a change at the top for Sanford PD. Sanford Police Chief Bill Lee first stepped down from his position, and then later, after offering to resign, was fired. Lee was replaced by Cecil E. Smith as the new Sanford Police chief. In Ferguson, MO, Police Chief Thomas Jackson had his entire police department shunted to the sidelines as the Governor put the State Police, lead by Captain Ron Johnson, in charge. The common thread of course is that in both racially charged cases, a white person was replaced by a black person. Of course, in the never ending war on noticing, we…aren’t supposed to notice that. It’s just a guy bungling the situation replaced by someone who is hopefully more competent. But in both cases with black victims and an activated civil rights establishment on the march; literally on the march, it makes perfect sense that the head of the law enforcement agency in question be headed by someone who’s black. And as a PR move, it’s worked great. 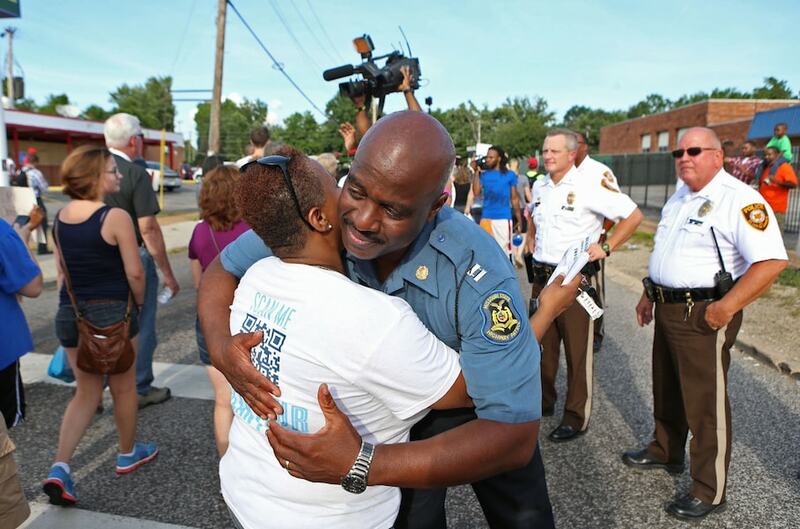 The media is full of respectful and flattering stories of Captain Ronald Johnson and it’s not just media hype, he’s achieved real results in bringing a boiling situation to a simmer and getting control of the looting after the Ferguson Police Department’s heavy handed military occupation-like attempt to gain control through superior firepower. And although Johnson does deserve all due credit for that, the fact is that he would not have been able to do that if he were white. In the post civil rights era, the realization of this started back in the infamous Rodney King beating and has continued up through the age of a Black President, from Trayvon Martin to Michael Brown. Black people do not trust white cops. They never have, and are unlikely to start in any of our lifetimes. We can gnash our teeth of this, and try even more community outreach programs that will fail like all the ones before, but in a town like Ferguson, MO, with a black population of 67%, the police department is 94% white. Mission not accomplished and it may never be accomplished. We can of course, go on and pretend that this isn’t a divided country, or we can stare down reality and admit that we have problems that another commission, or inner city funding, is not going to solve. Civil society and all of the threads that make a society work depend on social trust. That is increasingly in short supply in our society, but it is clearly missing in the relationship between Blacks and police, otherwise we wouldn’t have ‘The Talk.’ But, if we’re willing to accept these painful truths maybe we can do something to mitigate the damage these incidents play on our national psyche. We need to recognize that Black people really want to be policed by Black cops. I’m no fan of the concept of Affirmative Action. I think it’s a legal and constitutional stain on the country, but you know, we have a lot of stains. Maybe we ought to recognize that for black people, they need the trust in law enforcement that black law enforcement can provide and that white law enforcement, no matter how well meaning, will never be able to. So what am I suggesting? I think we need black cops to police black areas. This would require a massive hiring of new black police officers to police these areas, so this isn’t something that would happen overnight. It would take years to implement. But I think the benefits make it worth pursuing, and we certainly haven’t come up with anything else that’s made much of a difference. But a major nationwide recruiting effort with the subsequent publicity might make a lot of black youth consider a career in law enforcement that they wouldn’t otherwise have even considered. And not for nothing, but these are considered “good jobs.” People in high crime areas might consider calling the cops more, and actually talking to them, instead of avoiding “snitching.” If they can start trusting their local cop on the beat, maybe they can start trusting law enforcement at large. Certainly if a black cop shoots a black suspect, it’s not going raise the ire of the civil rights establishment. Eventually, when those incidents happen, maybe black people will have the same reaction to those shootings that white people have when a white or black cop shoots a white suspect; ignore it. Generally we default assume the guy had it coming, not that the cop set out to specifically murder someone. It’s a low bar of achievement I realize, but we have to accept that for our racially divided society, we can’t even reach that low bar. We need to try something, even if means recognizing painful truths. This entry was posted in Politica, Race and tagged Affirmative Action, Bill Lee, Cecil E. Smith, Ferguson, MICHAEL BROWN, race, race relations, Ronald S. Johnson, Sanford Florida Police Department, Thomas Jackson, Trayvon Martin, war on noticing. Bookmark the permalink. In theory that’s a good idea. But it’s been tried before, most notably in Washington, DC. Results have been mixed, at best. While DC hasn’t had as many serious racial incidents as it did in the past, the crime rate is still ridiculously high. While race is the obvious issue at work in Ferguson, it isn’t the only one. I’m not trying to solve crime, just provide a police force that black people can trust. I think if racial incidents have declined in DC, because cops increasingly look like the city they are policing, that’s a success.